Circadian rhythms are internal body clocks that regulate our sleep cycle. After traveling long distances, the circadian rhythm of the body is still aligned to our previous time zone. As a result, our body is supposedly asleep when it should be awake and vice versa. Jet lag is temporary and occurs often after you have crossed at least two time zones. The severity of jet lag depends upon how many time zones you have crossed and which direction you are traveling. Jet lag is common among people of different ages. However, in comparison, the severity of jet lag increases with age. Thus, older people require more time to recover from the symptoms. Pilots, flight attendants, and frequent business travelers are more prone to jet lag due to their lifestyle. Feeling weak and sleepy during the day and alert and awake during the night is common in people experiencing jet lag. Some patients also complain of disorientation and difficulty in functioning during day time. 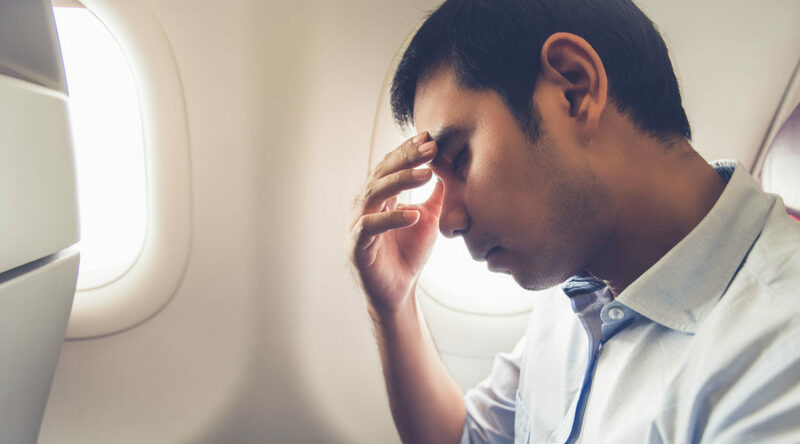 Other issues related to jet lag are queasy stomachs, mild fever, and menstrual complications in women. Medical attention isn’t always necessary for jet lag because it is a common occurrence among travelers. However, in severe cases, it starts to affect daily activities and also triggers other sleeping disorders. In these cases, it is recommended that the patient undergo behavioral therapy sessions. Jet lag can actually be self-treated or prevented altogether by behavioral adjustments beforehand. Here are some simple and effective ways to deal with jet lag. When planning for a trip, you can start altering your sleep schedules by adjusting your sleeping time according to the place you are going to visit. It can involve sleeping earlier or later and waking up on time to match with the expected time of your destination. Getting proper sleep the night before you travel is also necessary to avoid jet lag. Sunlight is a natural source of energy for our body for regulating its functions and adjusting the circadian rhythm. Hence, exposing yourself to more sunlight while traveling can help your body stay active during the daytime and recover from jet lag easily. Bright light therapy includes exposing yourself to a medium of bright artificial light to manipulate your body’s clock. This is essential if you stay indoors more often, or natural light isn’t available in the place you are visiting. Some of the tools applicable are dawn simulators, normal lamps, light boxes, and other artificial sources. Melatonin is a hormone that is released by the pineal gland in our brain when we are supposed to sleep. Melatonin supplements are used to reinforce the circadian rhythm, either for inducing sleep or staying alert. These aren’t highly encouraged as there are natural ways of regulating body functions, like warm water or tea, which helps the body to relax. Although taking sleeping pills is discouraged, it can help under extreme conditions. Sleeping pills, as prescribed by doctors, can be used to treat the effects of jet lag, but only on a short term basis. These pills help you sleep better, adjust to the new time zone and also help avoid sleep deprivation. Caffeine and alcohol are stimulants that can interfere and disturb your sleep schedules. Hence, it is necessary to avoid these while traveling, as it might have an effect on the severity of the jet lag. Exercise boosts our body regulations more effectively. Moderate exercises can help the body adapt to a new environment better. Exercise done outdoors is more beneficial due to the presence of natural light. Even on a flight, try moving around to keep body circulations active. Swacon International Hospital, a member of the International Society of Travel Medicine, provides a wide variety of services to prospective international and national travelers. Our services include travel medicine and consultations and will help make your traveling experience impeccable. Our trained sleep experts will also help diagnose as well as treat any sleep-related disorder that you are suffering through Diagnostic Sleep Studies.